"Just one application daily and within four to six weeks you will have fuller, thicker and stronger looking lashes." I have reviewed eye lash conditioners in the past, and I loved them all. But the problem I have come across, is that they are a little too expensive for my budget. So finally I found an eyelash conditioner I can afford that works just as well as the high end conditioning products. Let's face it. We get older, our eyelashes seem to get smaller. They get shorter and thinner, and in the past we have all been forced to resort to fake eyelashes, which are SUCH a pain. They fall off, they look fake, and they are a struggle to get on. Maximum Lash is a much better choice. Your eyelashes will look more natural, thicker and longer. Check out the amazing results. Once-a-day, at bedtime: apply a thin line of Maximum Lash to your lashes, above the level of your skin. In four to six weeks you will see results. I've been using this for a week, and I'm already starting to see a difference. One bottle of Maximum Lash will last you 3 months. Packed with strengthening and nourishing ingredients and botanicals like Biotin, Green Tea, Nettles, Mulberry Root, Copper Peptides, Octapeptides, vitamins and a prostaglandin analogue, Maximum Lash is an intense conditioner that delivers striking results. Lashes will appear healthier, longer and stronger. For more answers and frequently asked questions, click here to read more. Buy: You can purchase Maximum Lash for $48.95 on their website. Win: Maximum Lash is giving one lucky winner the chance to win their own tube of this fabulous eye conditioner!! 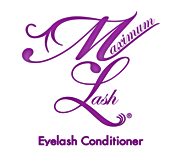 - Visit Maximum Lash and tell me one thing you learned about the product. -For 5 extra entries blog about it! Please make sure it's in it's own post! Giveaway ends 07/01/2010. Open to the US only. No PO Boxes please. Winner has 48 hours to respond to the winning email or another winner will be chosen. The site says Just one application daily and within four to six weeks you will have fuller, thicker and stronger looking lashes. I hope that is true. With age my eyelashes have begun to disappear and my chin seems to have gained those missing hairs. I learned it works on your eyebrows too....way cool! I learned that you only need to apply it once daily and in 4-6 weeks lashes will be thicker, longer and fuller! I learned that one small bottle will last about 3 months. I learned that this high-performance conditioner is fortified with vitamins and peptides to strengthen and enrich your lashes. I learned it is normal to feel a small tingle or itch on the lash after application, this will go away in about 3 days. It can last about 90 days! It lasts about 3 months. I learned that If used as directed your bottle will last approximately three months. I learned that no animal testing has been done. I learned that MaximumLash nourishes the eyelashes, giving them new vitality, transforming thin, brittle lashes into beautiful, luscious looking lashes. It takes approximately 4-6 weeks to see results. Also, I follow you via Networked Blogs! i learned that Some users have reported darker looking eyelashes. I learned that "MaximumLash is water based and will, therefore, not hinder false eyelash application." I looked at the Q&A section. I saw this: How long does it take to see improvements? If used daily it takes most users 4-6 weeks to see a difference in the appearance of their eyelashes. Each tube of maximumLash should last 3 months! I learned that with just one application before going to bed, that within four to six weeks I will have much improved lashes! Seems easy enough to fit into my daily routine at bedtime! I learned that only a small quantity of MaximumLash is needed to promote the attractiveness of your natural eyelashes and a bottle will last 3 months. I learned that not only does the Maximum Lash improve the apperance of your lashes but it also nourishes the eyelashes! I subscribed to your newsletter on here! I follow you through Network Blogs! Only one application a day and in 4-6 weeks lashes will be longer, fuller, stronger... wow - that would rock! i learned that lashes will be healthier. I learned that MaximumLash nourishes the eyelashes. I'm following via Newtworked Blogs. It unleashes the power of your natural lashes. I learned that it works on eyebrows as well, thanks! I learned you can use MaximumLash on your eyebrows as well! It's fortified with vitamins and peptides to strengthen and enrich your lashes! Can I use MaximumLash with eyelash extensions? Yes. MaximumLash is water based and will, therefore, not hinder false eyelash application. I learned that MaximumLash has not done any animal testing. I learned that you can see results in 4-6 weeks. Thank you so much for the lovely giveaway. one bottle will last 3 months! They are animal friendly! No animal testing! I learned that you will see results in 4-6 weeks. There is no need for false eyelashes, extensions or irritating fibers.